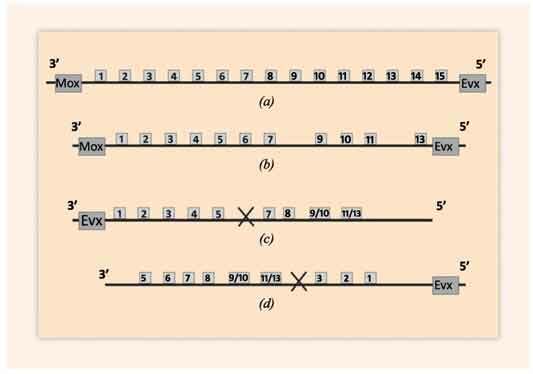 Hox gene collinearity relates the gene order of the Hox cluster in the chromosome (telomeric to centromeric end) with the serial activation of these genes in the ontogenetic units along the Anterior-Posterior embryonic axis. Although this collinearity property is well respected in bilaterians (e.g. vertebrates), it is violated in other animals. The A-P axis is established in the early embryo of the sea urchin. Subsequently, rotational symmetry is superimposed when the vestibula larva is formed. In analogy to the linear A-P case, it is here hypothesized that the circular topology of the ontogenetic modules is associated to the architectural restructuring of the Hox loci where the two discrete ends of the Hox cluster approach each other so that an almost circular DNA contour is created. In the evolutionary process the circular mode undergoes double strand breaks and the generated cluster ends are attached to the open ends of the flanking chromosome. This event may lead to a novel gene ordering associated with an evolutionary innovation. For example, the loss of Hox4 is followed by the formation of a shorter gene circular arrangement. The opening of this contour at the missing Hox4 location and its connection to the chromosomal flanking ends leads to a new diversification namely the creation of the unusual gene order of the sea urchin Hox cluster. Hox collinearity, Sea urchin, Echinoderm evolution. Institute of Biosciences and Applications, NCSR 'Demokritos' Athens, Greece.